There are a number of students at Dieterich who enjoy checking out cookbooks when they visit the library. 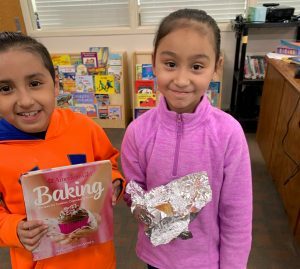 This week, one of those students returned her cookbook to Mrs. Ruiz, with a sample of delicious chocolate-chip banana bread that she made from one of the recipes. The third-grade student said her mother helped her just a little bit, but that she did most of the baking herself. We are proud to have such a talented baker in our building! Thank you Cassandra for sharing your talent!